Y’all have been posting them lately and now it’s my turn! Been way to long since I’ve done these. 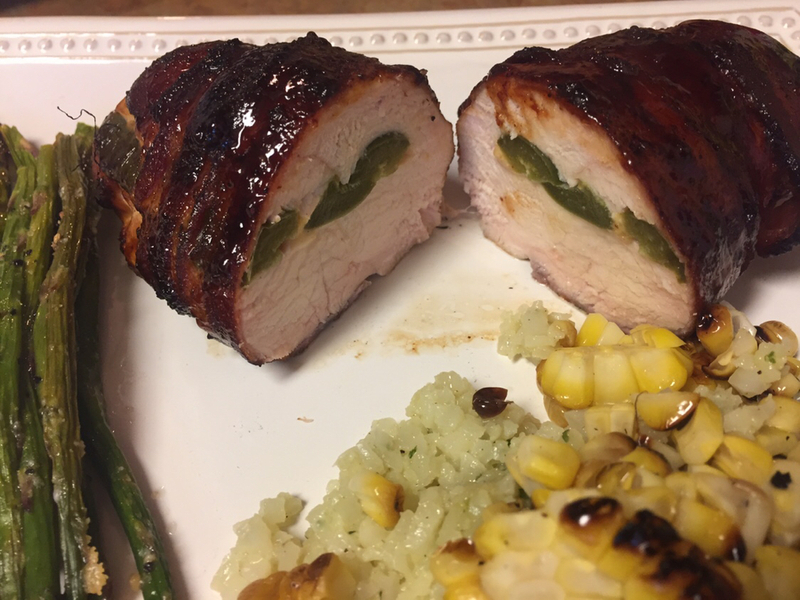 Chicken breasts (wife’s preference) stuffed with smoked cheese, jalapeño, wrapped in bacon, sprinkled with Sucklebusters Hog Waller Honey and glazed with Sucklebusters Honey BBQ sauce. Served with asparagus, corn on the grill and cauliflower rice (don’t ask). Pretty dang good meal. Been busy as all get out lately so it felt good to fire up the Kettle. Don't go for the " Rope cabinet " but I gotta say this is something else I've never done. I MUST try this. I love the Smoked Cheese idea. I bet it was delicious !! The Asparagus and Corn looks great too ! there is a couple ideas for ya..
Good lookin groceries Sooner. I am past due on those as well. Thanks y’all - W.V. there’s nothing to it. You would knock them out of the park for sure. What a great idea. Those breasts looks awesome. I'm with the asparagus too. Cauliflower not. You guys keep adding new stuff to my to do list continuously. Love it. Looks awesome, sir! I tried something like these not long ago that didn't turn out anywhere near this pretty! That looks delicious. Great color! Boomer Buddy, once again you have raised the bar on Chicken Diablos - - - - I remember the first ones you did looked like the cover of Southwest Cooking Magazine and these are of equal viewing quality. I also agree with the Missus on the breast choice - - - they work so much better for me I know. Parts - thanks so much for the kind words. OK... so dissecting this prep (pun intended) did you butterfly the chicken or try to "pocket" the stuffing? txsmkmstr wrote: OK... so dissecting this prep (pun intended) did you butterfly the chicken or try to "pocket" the stuffing? On the cheese, I had one block that sat right above the tube and it was the one I tried first and tossed. The others have mellowed much better. Still want to put lighten the smoke next time by putting the tube in the fire box but this will definitely not go to waste. Just finished up another 14 cheese blocks with the cooler weather over the weekend. Puts me up to 52 blocks this year. Tat plate there is a thing of beauty fo sure. TwoGuysBBQ wrote: Tat plate there is a thing of beauty fo sure.